When a species becomes extinct, the world suffers an irreparable loss. The same holds true for a culture. Archeologists and anthropologists attempt to reconstruct the values, language, and lifestyle of a lost people through artifacts and documents, but nothing can capture the vitality of a society, as can those who have experienced it firsthand. The presence of the British in India gave rise to a sub-culture that flourished for the better part of three centuries. The Anglo-Indians, a hybrid people of Indian and European descent, carved a unique niche for themselves in British India. While their language, religion, and educational background were European, they developed a style of life that borrowed from both their British and Indian progenitors but jelled into something that was essentially their own. After India gained Independence in 1947, the majority of the Anglo-Indian community emigrated to the UK, Australia, and Canada. Today their children and grandchildren no longer have any psychological or emotional ties with India. In addition, most of these early Anglo-Indian emigrants are now elderly, and there is little doubt that their cultural heritage will, within a generation or two, be extinguished forever. Over 80 submissions from both Anglo-Indians and non Anglo-Indians were received from India, Australia, USA, UK, Canada, New Zealand, and Germany. A panel of five judges selected 42 articles through a blind judging process, and these now constitute the content of "The Way We Were". The anthology has been edited by Margaret and Glenn Deefholts. 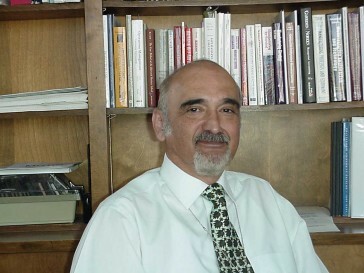 R. Dean Wright, Professor of Sociology (Iowa), who earned a doctorate for his thesis on Anglo-Indians, says, "I have looked back over the history of the Community and note several 'bumps' of cultural surge, times when the group took its destiny into its own hands and demanded it become something else. The something else was ultimately a movement to become more permanent, more lasting, to preserve its heritage for future generations . . . a cultural heritage that uniquely identifies that group as having a life that will last far beyond the life of any member . . . a heritage found in the arts." To this purpose, so well expressed by Dr Wright, "The Way We Were" has been compiled and published. It joins "Anglo-Indians: Vanishing Remnants of a Bygone Era", "Haunting India" and "Voices On The Verandah", a series of books about Anglo-Indians. The publication of this book has another vitally important and synergistic function. The gross proceeds of all sales - publishing costs are borne privately - will go directly to CTR Inc., the charity helping less fortunate Anglo-Indians in India. The series thus serves a dual purpose: to preserve the culture of the Community and to provide much needed resources for its poorer members in India. Blair Williams, the publisher of this effort, is a Chartered Engineer (London) who immigrated to the USA from India in 1976. He has spent the last 24 years as an executive in manufacturing companies and is now an Industry Professor at Brooklyn Polytechnic. He is the author of a technical publication, "Manufacturing for Survival (Pearson 1997)". On a visit to India in 1998 he was appalled to see the condition of the seniors of his Community, evoking the all too distressing realization that, "there, but for the grace of God, go I." On his return he set up CTR Inc., a 501c(3), 'Not For Profit' charity, expressly to help indigent Anglo-Indians in India. Today the charity provides monthly pensions to over 230 seniors in three major cities in India and is helping to educate over 100 children. The Anglo-Indians, a hybrid people of Indian and European descent, carved a unique niche for themselves in British India. 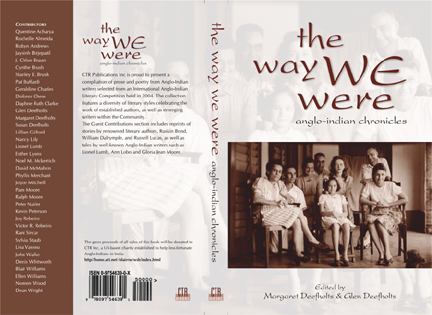 "The Way We Were - Anglo-Indian Chronicles", edited by Margaret Deefholts and Glenn Deefholts, published by Blair Williams, CTR Inc Publishing, PO Box 6345, Monroe Twp, NJ. This anthology is both an eulogy and an elegy on a wonderful community now scattered all over the English-speaking world, facing extinction because of its wide dispersal, and the stretching, tautening and snapping of its India roots. "In 2004, 'The Way We Were' was launched, inviting articles from across the world that described Anglo-Indian culture. As we stated in the guidelines," publisher Blair Williams says in the Preface. "The publication, depicting our Anglo-Indian way of life, will cover a broad contemporary canvas. We would like to capture not only who we were but what we were in all walks of life - the way we lived, worked, rejoiced, loved, laughed, and cried." Over 80 submissions from both Anglo-Indians and non-Anglo-Indians were received from India, Australia, U.S.A., U.K., Canada, New Zealand, and Germany. A panel of five judges selected 42 articles through a blind judging process, and these now constitute the content of 'The Way We Were'. R. Dean Wright, Professor of Sociology (Iowa), who earned a doctorate for his thesis on Anglo-Indians, says, "I have looked back over the history of the Community and note several 'bumps' of cultural surge, times when the group took its destiny into its own hands and demanded it become something else. The something else was ultimately a movement to become more permanent, more lasting, to preserve its heritage for future generations ... a cultural heritage that uniquely identifies that group as having a life that will last far beyond the life of any member ... a heritage found in the arts." "The Way We Were" is a wonderful record of the rich history, heritage and culture of Anglo-Indians. By raising funds to support the work of CTR Inc., the book not only remembers the past, but also makes a vital contribution to helping members of the Community in India today. Anyone interested in the past and present Anglo-Indian community and culture will enjoy this anthology. This new book is warmly recommended. "The Way We Were" says it all and keeps us more fortunate 'ex-India wallahs' in touch, as well as raising funds and awareness, thanks to CTR. I received two copies of TWWW. It has a fetching look about it. Shall start reading it after the Semester gets under way. Congratulations on producing what must prove to be a fine , much needed insiders' view of the community. It is a beautiful book about a wonderful people. I am doing a piece for Desi Talk, with large quotes from your preface. Blair . . . You have been holding out! You must give us lessons in thigh dancing before it's too late. Great book. Wonderful essays. Will send you my enthusiastic comments in full after I finish reading it.